Master Dromtonpa was a very famous Grand Master in Tibet, and he was also a sutra translator with great kindness towards Tibetans. In order to learn supreme Dharma from the Venerable Master Atisha, he traveled from Tibet to India. The weather in India was blisteringly hot, before long he became ill. The doctor said, “You can’t stay in India. If you remain in India, you will die soon.” He said, “What is my life worth? Since the very beginning, I have passed through innumerable lives and deaths, and have not accomplished anything of genuine significance, but if I can meet the Master and study the Secret Dharma, even my death will be honorable.” In order to find his Master, Dromtonpa was not even afraid of death. His illness was exceptionally severe, and each day he could only sip a little water. It went on for a long time, and day and night he was always thinking about seeking the Master. Because of his destiny, and because of the spiritual help of the Buddhas and Bodhisattvas, he did not die there in India! After seven years’ suffering, he was able to find the Master. After making conversion to the Master, he did not have money to make an offering to his Master. So for the sake of studying the secret dharma, he worked for others on a farm in the daytime, and then in the evening he went to his Master and offered whatever he had earned. He cleaned his Master’s dwelling, and whatever his Master asked him to do. He slept less than three hours each night. Dromtonpa stayed closely with his Master for twelve years in India. During these twelve years, he had been conducting ascetic practice when following his Master wholeheartedly, never having enough food during the day, or enough sleep at night. At the end he became his Master’s favorite disciple and learned all the Master’s secret Dharma, and obtained great achievement. At any time and under any circumstances, he could invite Green Tara to give guidance. When he went to pray for the secret Dharma from the Master, the Master said: “If you want me to teach you the secret dharma, you have to accomplish one of the three options, in order to receive my teaching. “The first, bring the treasure that is equivalent to the value of your life to make an offering to your Master. If you choose this condition, I will be the loser, because your life is worthless. “The second, if you want to learn the secret dharma, sacrifice your life to make an offering. But in this case, you will be the loser, because you won’t be able to learn the secret dharma if you’re dead. I can see your sincerity, so let me give you the third option. The Master said, “From tomorrow, except for answering the call of nature and begging for food, I want you to do calligraphy. The time you take for answering the call of nature cannot exceed the time of counting clapping your hands 100 times. After 100 beats, you must begin your work. 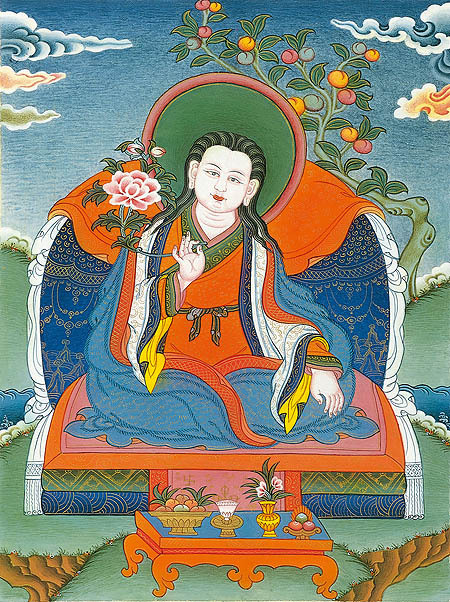 Repa Dorje worked labored for ten years under the strict rules of his Master. Sometimes he did not even have any food because he had to go far away for begging. When the weather was good, he could beg for food in the nearby villages and by running back, he almost was on time. If the weather was bad, there was no way to go out and beg. However, if he did not go out, his Master would scold him, saying that, “I told you to go out and beg, but you didn’t listen to me and didn’t go out. How dare you disobey my order? The Master said, “When I told you to work, I didn’t discuss any “deluge of rain” or “roads not good for travel.” Even you were dead on the road, I wouldn’t care; but if you’re late, it’s your fault! It has nothing to do with me!” And then he loudly scolded him again. The Master said, “You! How dare you argue with your Master? It’s true that yesterday I told you to write small characters, but I never told you to write them so small! Are you trying to piss me off? It would simply be better for you to die!” The Master then kicked him out of the house and locked the door. Repa Dorje knelt outside his Master’s door for several days and several nights, and the Master ignored him completely. After Repa Dorje endured this kind of hardship for over ten years, he wrote a great sutra. After over ten years, he received the transmission of all secret teachings from his Master. Later he obtained great achievement, and became a grand master with incredible supernatural power! Everyone respectfully called him the Buddha Master of Great Supernatural Power.